On Saturday, my friend Fontella surprised me by making me Curry Chicken. On Sunday, my friend Nat dropped off a cooler full of oysters freshly pulled out of the bay by Nat's knowledgeable hands. Is this a great weekend or what? 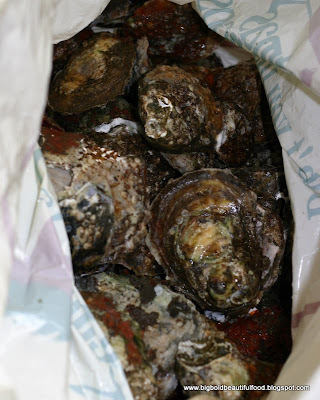 Giant bag of oysters on ice in cooler. Coming au natural without the sophistication that cultured oysters bring, these oysters were gnarly things, reminiscent of the crusty ghost pirates in Pirates of Caribbean. 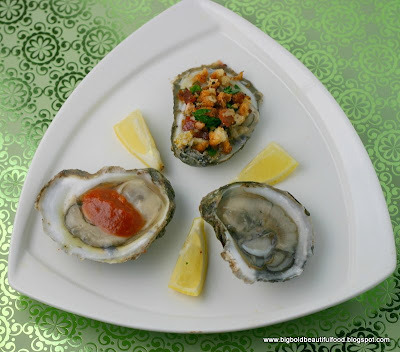 Most were Super Bowl sized oysters, and some were even padded with other smaller oysters that were fused to their shells. These XXL oysters found themselves over the white hot fire of my Big Green Egg, poached open to be consumed with melted butter, hot sauce, and lemon. 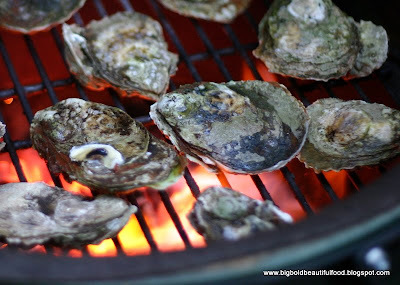 Oysters coaxed open by a live fire on the Big Green Egg. 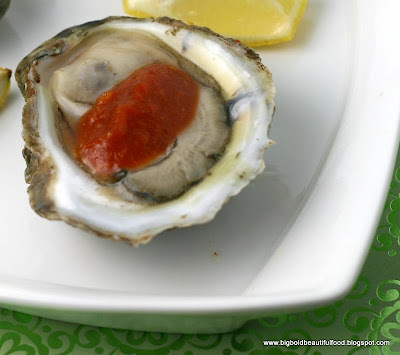 Poached oysters with melted butter and hot sauce. The smaller ones my husband pried open, and I served them plain, with cocktail sauce, and with a crunchy bread topping of toasted bread crumbs, garlic, shallots, scallions, and bacon. 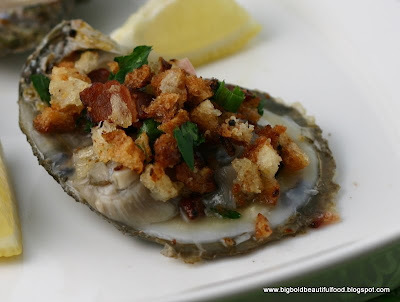 Raw oysters with crunchy bacon and bread topping. 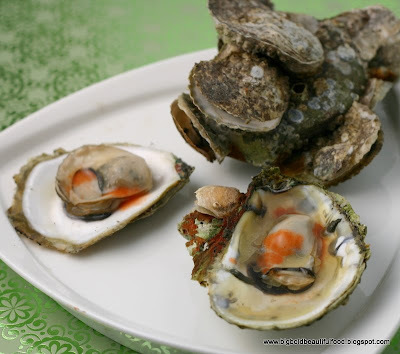 Raw oysters with cocktail sauce. My favorites were the raw oysters, small, briny, and sweet, with cocktail sauce and lemon. The poached oysters were okay, but their large sizes were a little too much of a good thing. 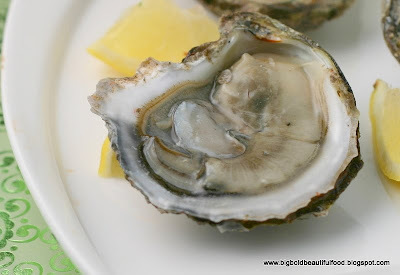 I shucked those oysters and plan to cut them up and put them in soup tomorrow. Thank you, Nat, for fishing up some dinner on a beautiful Sunday. WOW!!! What a feast! Fantastic pics! mmmm, you remind me that I haven't been out for oysters in a while. lucky you to receive such a gift!